Thought I'd take a diversion from animation this week and explore the other side of my blog's title, video. I recently discovered CineFix's YouTube channel with their home made movies. What impresses me most about them is their ambitious undertaking to recreate contemporary film scenes and film trailers using almost entirely 'in camera' effects. If you're not familiar with the term 'in camera' it means, what the film maker shoots with the camera is what you see in the final scene with nothing added. Batman Trilogy director, Christopher Nolan is very big on 'in camera' effects, often only using digital effects to remove things like boom arms and wires from the action so you can't see how a character or vehicle is flying through the air. What makes CineFix's productions so interesting is that they're obviously trying to recreate expensive movie scenes and special effects on a very low budget. Watch their recreation, shot for shot, of the Iron Man 3 trailer below to see what I mean. Clearly it's a long way from looking as good as the original trailer. If you had paid to see Iron Man 3, and saw cardboard cut outs representing Tony Stark's Iron Man suits you'd want your money back. However as an exercise in home made film making it's interesting to see how the Cinefix team approach recreating the various scenes. 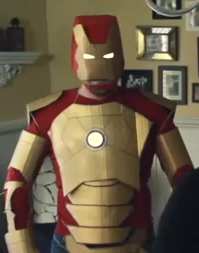 You can watch the behind the scenes for Iron Man 3 below. Whilst the cardboard props are a little obvious there are plenty of techniques that could be used if you were attempting to make your own film, with higher production value but still without a big enough budget for special digital effects and CGI. As an example watch CineFix's recreation of The Matrix, Bullet Time scene below. I think they did a pretty good job on this one. If you squint a little you could almost believe it's the actual scene! Gotta love those slinky bullet trails - I thought that was genius. I'd recommend CineFix's channel to any low budget filmmaker for both inspiration and motivation. Their home made films are the kind of thing you watch and think, I'd like to give that a try.